During the autumn leave, celebrations of the Mexican Day of the Dead took place in the Marolles. Featuring workshops for children, dance initiations, an exhibition and a festive parade on Saturday 3 November. For this parade, the MetX brass band Remork & Karkaba performed together with the Mexican group Sonosfera. ‘Dia de Muertos’ is also celebrated enthusiastically in Brussels. 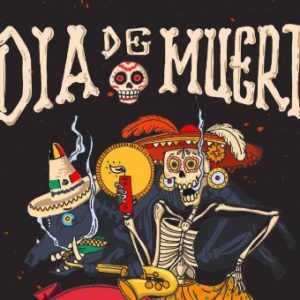 The Centre Culturel (CC) Bruegel, located in the heart of Les Marolles, gathered residents, schools, merchants and other actors from the neighbourhood to organise a contemporary version of the Mexican Day of the Dead. For a whole week, children’s workshops were held during the day, while the parents were able to get acquainted with Mexican dance traditions like Zapateado in the evening. The celebrations were highlighted on Saturday by a parade of more than 300 people, coordinated by MetX as part of the neighborhood project Megafonix. Some Mexican musicians also came to Brussels for the occasion. Members of the group Sonosfera accompanied the dance initiations, gave a few concerts/jams and shared their repertoire with MetX brass band Remork & Karkaba. On Saturday November 3, all musicians played together a number of traditional Mexican songs during the concluding death march through Les Marolles. After which, on arrival in the CC Bruegel, they started jamming with a group of mariachis amongst others. Would you like to know more about these/other projects from MetX? Contact Jan Ockerman for further information.